Brief Synopsis – An Air Force DJ is transferred to Vietnam in 1965 and his on-air antics cause a lot of friction among the radio station personnel. My Take on it – This is always a fun movie to watch because this was specifically tailored for Robin Williams’ kind of ad-libbed humor. He apparently wrote all of his character’s jokes and they are always hilarious no matter how many times one watches this movie. The plot is super thin but who cares because the point of seeing this is to laugh at Williams’ funny antics. The music used in the movie to show the daily routines of the US soldiers is excellent especially Louis Armstrong’s What a Wonderful World. Bottom Line – Plot is a bit weak, but Williams performance makes you not care about that at all. Hilarious ad-libbed dialogue is perfect. Amazing soundtrack! Highly recommended! I’ve seen this one a million times, and plot never even crossed my mind. Reading your review, I realized I don’t really remember there being a plot. 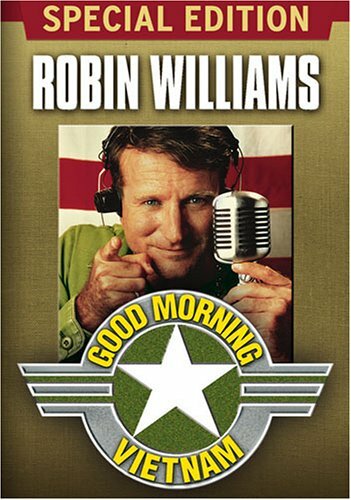 I remember Robin’s jokes, his fights with the polka-lovin’ superior officer and, of course, young Forest Whitaker. That’s my point exactly. This is one of the few movies that doesn’t need a plot and is still amazing. Tnx for stopping by and commenting! I agree with the previous commenter – I never once thought about the plot, either! But, as you pointed out, this film doesn’t need a plot. Robin Williams carries the movie effortlessly. yep, seems we all agree that no one give a hoot about plots in movies where the actor carries it all just with his screen presence and humor. I love this movie! Great quote to start the article too! That was one of my favorites. I saw this when it came out in the theaters. I wasn’t expecting the serious part of the movie. I was just expecting wall-to-wall Robin Williams antics through the whole thing. So, that back story made the movie that much better for me. My parents owned the cd soundtrack of this movie. Instead of listening to the music, I always skipped to the Robin Williams tracks.